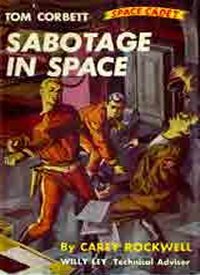 Tom Corbett is the hero in this series of eight science fiction novels written by Carey Rockwell (a pseudonym) with Willy Ley as "technical advisor" and published by Grosset & Dunlap 1952-1956. 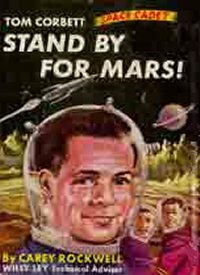 In addition to the book series, Tom Corbett was depicted in television, radio, comic books, and other media in the 1950s. 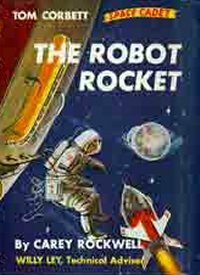 Joseph L. Greene of Grosset & Dunlap developed Tom Corbett, Space Cadet, inspired by the 1948 Robert A. Heinlein novel "Space Cadet" but based on his own prior work. 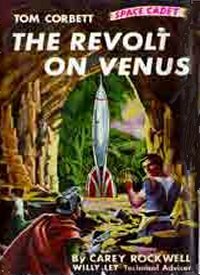 Greene had submitted a radio script for "Tom Ranger" and the "Space Cadets" in 1946, but it remained unperformed when Heinlein's novel was published. Greene then reworked his radio script into a script for a daily newspaper adventure strip, which was never produced. 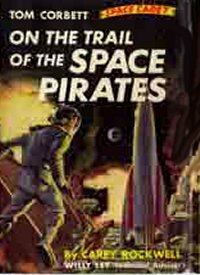 The stories followed the adventures of Corbett, Astro, Roger Manning and in the final volume T.J. Thistle, cadets at the Space Academy as they train to become members of the Solar Guard. 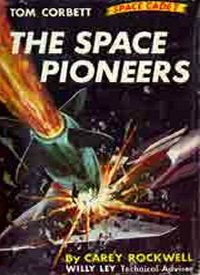 The action takes place at the Academy in classrooms and bunkrooms, aboard their training ship the rocket cruiser Polaris, and on alien worlds, both within the solar system and in orbit around nearby stars. Tom Corbett first appeared on television. 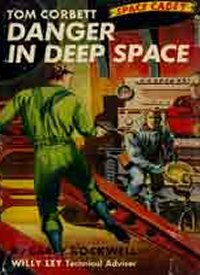 The stories initially closely followed the scripts written for the unpublished newspaper comic strip Tom Ranger, Space Cadet, by Joseph Greene from 1949. The program was one of the few that ran on all 4 TV networks of the era (ABC, CBS, Dumont, NBC). Using the same cast as the TV series, a radio program ran from January 1, 1952 to June 26, 1952, initially in 15-minute segments three times a week and then as a half-hour show twice a week. The Tom Corbett - Space Cadet comic strip by Ray Bailey, ran Sunday and daily in American newspapers, from September 9, 1951 to September 6, 1953. Paul S. Newman scripted through February 8, 1953. 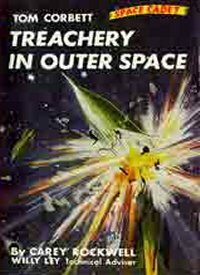 Starting in 2016, some titles are being reprinted in paperback with new cover art.